While it may be the destination that inspired your road trip, it’s all of the stops and sights along the way that make the experience even more enjoyable. 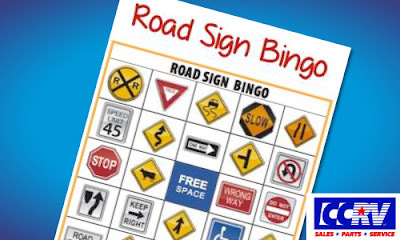 To keep your family and friends from getting bored on those long stretches between stops and during those long nights at the campsite, fill your road trip checklist with these exciting road trip games and boredom-fighting accessories. Road trip bingo is the perfect road trip game for kids and adults, and it’s 100-percent free to play. Print off plenty of free cards online and give each player a pen or marker. Have everyone mark off the sites on their bingo card as you pass them, and be sure to keep prizes on hand for the winners. If you want to reuse the same cards multiple times, be sure you have hard surfaces for each player to use and plenty of pennies or other objects to mark the cards with. Take the “Worlds Greatest Word Game” on your next road trip to keep your driver and passengers laughing non-stop. Mad Libs are available as books, apps or downloads, so pick your favorite version and pack it in your RV. Sick of excessive data charges on your cellphone bill and having to avoid primitive campgrounds because they don’t offer free WiFi? Pack the Autonet Mobile router, and you’ll have 3G wireless internet access anywhere in your RV whether you’re cruising down the road or parked at a campground. Even better, the signal travels as far as 150 feet, so you can share your internet access with friends or use it in a hotel room with your vehicle parked nearby. Before you hit the road for your summer adventures, outfit your home on wheels with road trip supplies at CCRV. And if you’re not in the recreational vehicle of your dreams yet, we offer a wide variety RVs and motorhomes. A question for the ages! Motorists may favor diesel motor oils over there gasoline counterparts for a few different reasons. It is safe to use a diesel oil in your gasoline engine, provided the diesel oil meets the appropriate specifications and viscosity requirements of your engine. For example, if your gas engine calls for a motor oil that meets the API SN specification, you can safely use a diesel oil of the correct viscosity that meets the API SN spec. For the typical gasoline application, however, a diesel oil isn’t required and the more appropriate choice is a quality gasoline motor oil for both performance and value. The American Petroleum Institute (API) publishes its “C” category of specification for diesel oil (currently CJ-4) and its “S” category for gasoline motor oil (currently SN). It’s common for today’s diesel engine oils to carry both the API CJ-4 and API SN specifications. Though they’re truly designed for diesel applications, they can be used in gasoline applications for motorists who want to use one oil in all applications. If the diesel oil carries both specs, the oil is safe to use in diesel and gasoline applications. If the diesel oil does not carry the “S” category, AMSOIL strongly recommends against using it in gasoline applications. Some motorists may have been told diesel oil is formulated with special components not available in gasoline motor oils, such as more robust detergency additives to handle the soot inherent to diesel engines. In their minds, diesel oils are analogous to better protection. Diesel and gasoline oils are formulated with a variety of additives that improve wear protection, corrosion protection, resistance to foaming, viscosity retention and more. Whether the application is gasoline-powered or diesel-powered, many of the same additives are used based on what they are designed to do in the formulation. Motor oils contain additives designed to manage the byproducts of combustion, and some of those byproducts change, depending on whether the engine runs on gasoline or diesel fuel. If your vehicle uses a gasoline engine, it’s best to use an oil that contains the correct additives to handle the byproducts of gasoline combustion. The same holds if you’re operating a diesel engine. If your gasoline engine is heavily modified to put out more horsepower, using a diesel oil can be beneficial. It’s likely modified engines will need a higher viscosity to withstand the increased stress. You can turn to diesel engine oils for those needs or you might want to consider a racing oil, depending on your engine modifications and lubrication requirements. Many times the engine builder will help provide insight as to what success they have found. Outside of that, if you have a bone-stock gasoline-powered application it’s best to stick with a gasoline motor oil. They are designed for that type of application and have the components required to manage that engine. Lubricating a clutch with oil seems like an invitation for slippage and inconsistent shifts. Lubricating a clutch with oil seems like an invitation for slippage and inconsistent shifts. However, a properly formulated oil can reduce clutch slippage. Here’s how. Wet clutches are widely used in motorcycles and dirt bikes. The term simply means the clutch is lubricated with oil, as opposed to a dry clutch. A wet clutch typically lasts longer and is more forgiving to operate than a dry clutch. As shown in the images, the clutch connects the engine and transmission via a series of alternating friction and steel plates. Friction plays a big role in proper clutch operation. New Single-Remote Bypass Filter systems are now available for Ford* 6.0/6.4L and GM* 6.6L applications. The systems include all components necessary for installation (including parts, hose, Ea® Bypass Oil Filter [EaBP90] and installation instructions), providing increased convenience and value for customers. For questions on how to purchase AMSOIL products call me today. 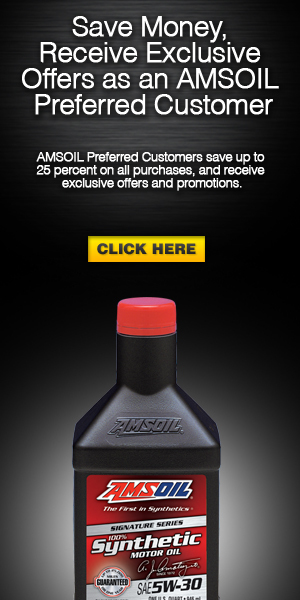 If you're interested in carrying AMSOIL we can help you become an AMSOIL Dealer. Launching June 27, new AMSOIL Synthetic DCT Fluid is designed to protect sophisticated dual-clutch transmissions during the most intense, high-heat operating conditions. Synthetic DCT Fluid is the perfect choice for automotive enthusiasts who expect fast, smooth shifts from their high-performance vehicles. The extreme pressures and temperatures generated by modern vehicles can lead to a serious condition known as thermal runaway. As temperatures in the differential climb upward, gear lubricants lose viscosity and load-carrying capacity. When extreme loads break the lubricant film, metal-to-metal contact occurs, increasing friction and heat. This increased friction and heat, in turn, results in further viscosity loss, which further increases friction and heat. As heat spirals upward, viscosity spirals downward. Thermal runaway is a vicious cycle that leads to irreparable equipment damage and ultimately catastrophic gear and bearing failure.